Do you pay attention to the ingredients list on the label of a food that you buy from store? If you don't, I highly recommend you to do so. Pay close attention to what you are getting for the price you are paying for. Most of the time, it’s hard to believe why on earth they have a long list of ingredients when the food is so simple. It’s hard to buy organic all the time and you may not be able to find an organic version of the product you are looking for. Whenever possible try homemade rather than the preservative and unknown ingredient filled food from the store. Quesadillas and tacos are my kids' favorite. Since it’s handy and easy to prepare, I like to keep soft tortillas in my refrigerator handy. I used to buy the tortillas from the store, but I was really perplexed by the long ingredient list and wondered why a simple flour tortilla needs these many ingredients because it seems similar to our Indian Roti. Then I started the research for the ingredients and experimented with plain flour, salt and water, which was really hard to roll and ended up in undesirable results. A leavening agent with some fat was needed to make it more pliable and after several experiments, I got this proportion that yielded a fair result that was acceptable for me and my family. I have been making this from last year and they are pretty good for making enchiladas, burritos, quesadillas and tacos. Hope you will try this recipe and switch to homemade version of tortillas instead of the store bought preservative filled tortillas!! An image is worth a thousand words. 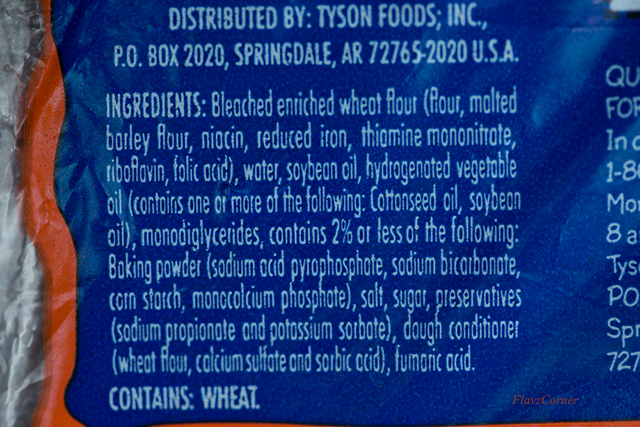 Below is the list of ingredients from the packet of a common brand of flour tortillas. 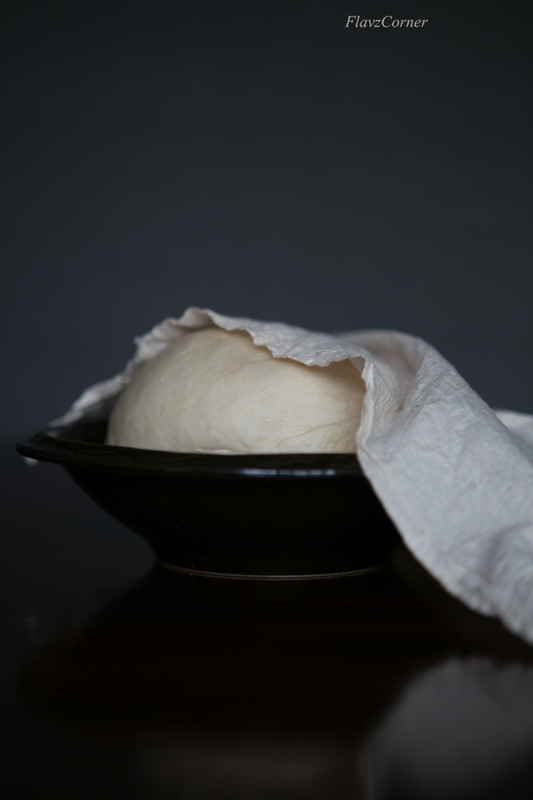 Knead all the ingredients together to for 5 minutes till a soft elastic smooth dough is formed. I used the stand mixture with a hook attachment to make the dough. You can use your hands to make the dough. Make sure that the dough is soft and not sticky. Cover it with a kitchen towel and keep it aside for 20 minutes. Pinch out 15 small equally sized balls from the dough. Lightly flour the rolling surface and smooth the balls to form nice balls without much crevice. Cover the balls with the kitchen towel. Lightly flour a ball and roll into circle. It will tend to stretch back, but keep rolling by rotating the sides and flipping the rolled circle until you get a very thin tortilla. Heat a crepe pan or non stick pan. Once the pan is hot, lower the temperature and place the tortilla on the hot pan. Wait for 30 seconds, small bubbles starts to appear, flip the tortilla and cook till it starts to bubble up and small light brown dots starts to appear and the tortilla is evenly cooked. 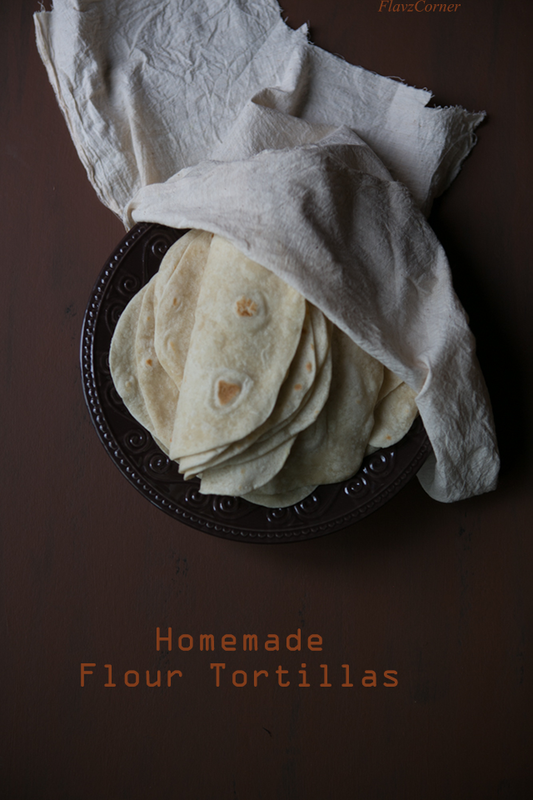 Transfer the tortilla into a dish lined with muslin cloth. Cover the cooked tortilla with muslin cloth. Prepare rest of the tortilla the same way as in the above step and wrap them in muslin cloth to keep them soft and not soggy from the steam till ready to use. Left overs can be refrigerated in ziplocks after cooling them. Just heat a non stick pan and warm up the tortillas on both sides till they are soft. Make sure you give enough resting time for the dough, which helps to roll the tortillas. All purpose flour will tend to stretch back while rolling, but if you keep rolling for a bit, it will start to come along and forms very thin circles. Its hard to get perfect circles if you have crevices on the dough, so its important to smooth them out before rolling. Its by practice you can get a perfectly circled tortilla. I always gets my first few tortillas with funky shapes. the shape really doesn't matter, if you are using them in enchiladas or taquitos as you will be rolling them anyways. Tortillas look yumm and really looks like store bought, should try it sometime. my..that list of ingredients of tortillas is scary! 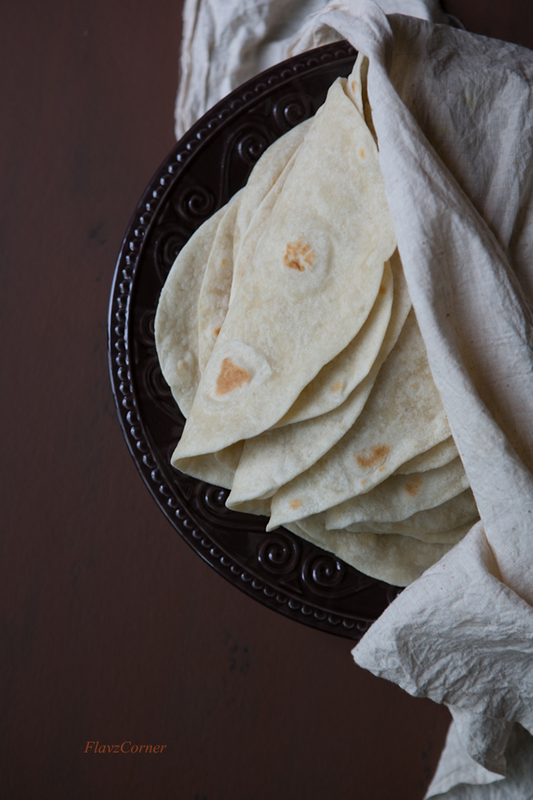 Your tortillas look so beautifully done! Home made tortillas are the best. After seeing the label, who would want to buy those. Your version looks soft and good. Interesting that there's baking powder in it, which is new to me. Will do that next time. Baking powder makes it more pliable like rotis and helps to balance the amount of oil that goes into it which in turn results in thin tortillas. Thanks Rafeeda!! Yes, always look for the ingredient list. I too had experimented without baking powder, but they were rubbery. Its the baking powder and oil that makes is soft and pliable. Hope you will try it. OMG... one never looks at the ingredients list. I was a great fan of Maggi until recenlty when my love has been sabotaged by the recent allegations. Well, I should be a natraj pencil by now, if maggi did have all that lead that they say. Anyways, comign to the point. I couldn't agree more about goign homemade on all possible edible items. Your tortillas look super soft and the colour is so much the same, I think. Kudos to you and I am going try these very soon. Thanks for sharing. Thanks! Please let me know how it turns out for you Sherin. Really useful recipe to have. Thanks for sharing! Thanks Indu!! Hope you will try it. Nothing can a homemade bread, they are awesome! That label is frightening for sure! Glad you shared this amazing recipe. Tortillas looks nice and soft. Will sure give it a try! I make corn tortillas all the time, but rarely flour ones. I should -- you're right, it's easy and they're so much better. And better for you. Amazing all the junk companies put in food, isn't it? Super post -- thanks.